The pool and the track were where it was at, medals-wise, with nine Swimming gold and eight Athletics gold up for grabs. 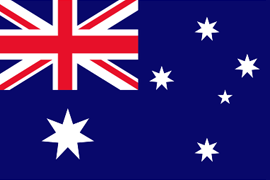 The Australians smashed the medal tally once again and Nigeria made a clean sweep of all Para Powerlifting gold. 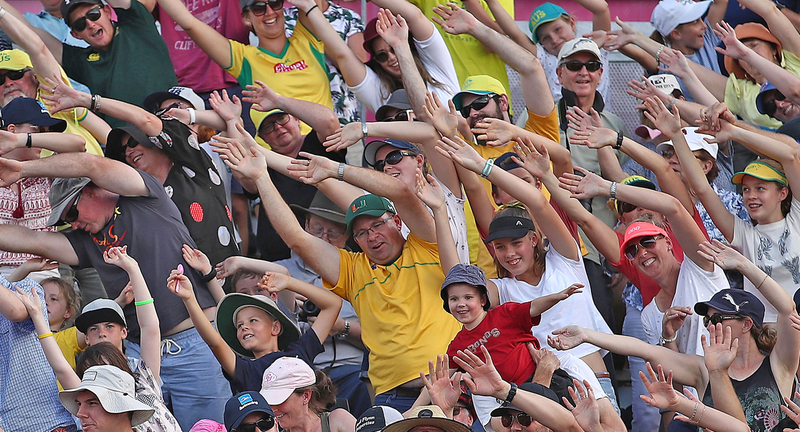 Here are all the highlights from Day Six of the XXI Commonwealth Games. It was a big day for Nigeria at the Carrara Sports and Leisure Centre, dominating the Para Powerlifting competition with a gold medal win in all four disciplines. Roland Ezuruike claimed the gold in the men’s lightweight final with 224.3 points, fellow Nigerian Paul Kehinde secured silver and England’s Ali Jawad picked up the bronze. Esther Oyema won gold in the women’s lightweight final with a world record score of 141.6 lift at the Carrara Indoors Sports Centre. Compatriot Lucy Ejike secured silver with 134.1 points and England’s Zoe Newson claimed bronze with 106.1 points. Ndidi Nwosu secured gold in the women’s heavyweight final with her score of 110.4. Louise Sugden of England took silver with 89.2 points. 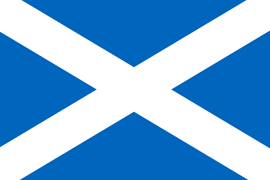 No bronze medal was awarded in the event due to there only being four competitors. Abdulazeez Ibrahim rounded out his nation’s gold overhaul in the event winning the heavyweight final with 191.9 points. 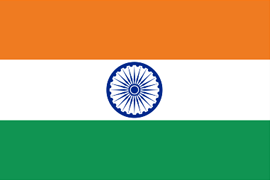 Malaysia’s Yee Khie Jong took home silver with 188.7 points and India’s Sachin Chaudhary claimed bronze with 181.0. 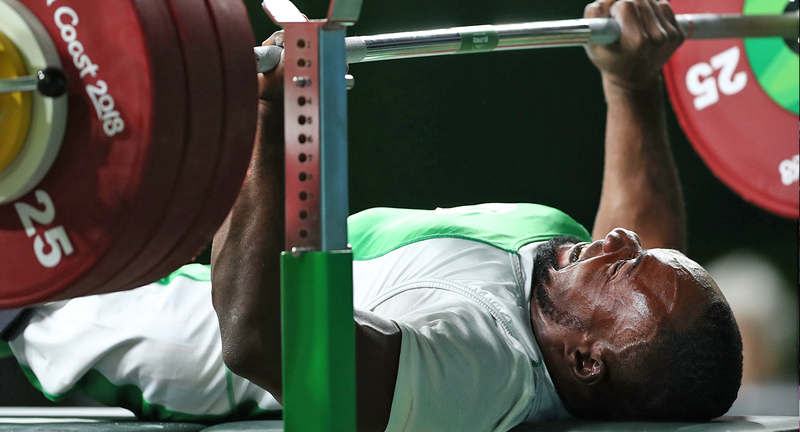 Roland Ezuruike of Nigeria competes in the para Powerlifting men’s Lightweight final. 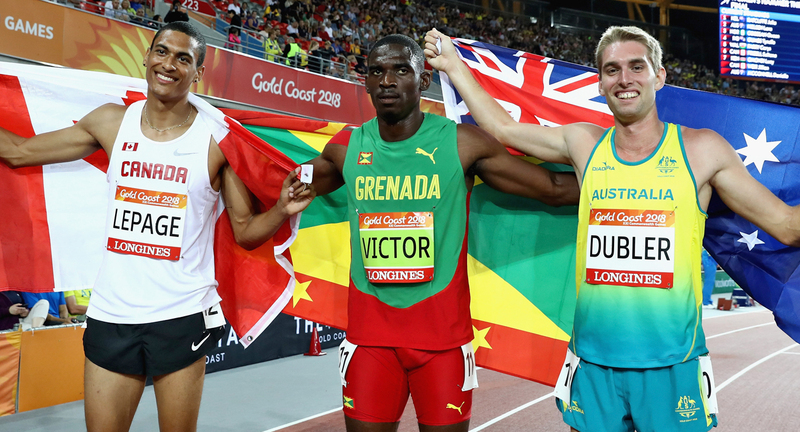 Lindon Victor became Grenada’s second gold medallist at a Commonwealth Games (after Kirani James at Glasgow 2014) with a surprise win in the men’s decathlon. 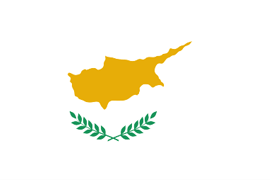 Fourth in the competition with four events to go, Victor benefited from strong discus and javelin throws, and the withdrawal of defending champion Canada’s Damian Warner to win with 8303 points. 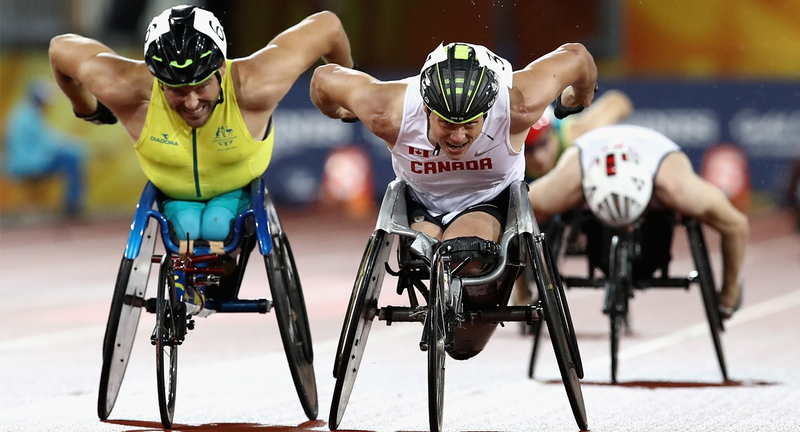 Canadian Pierce Lepage took silver with a personal best of 8171 points while GC2018 Athletics Ambassador Cedric Dubler battled through elbow pain to claim bronze with 7983 points. Silver medallist Pierce Lepage of Canada, gold medallist Lindon Victor of Grenada and bronze medallist Cedric Dubler of Australia celebrate after the mens Decathlon 1500 metres. His last T34 1500m event, GC2018 Ambassador Kurt Fearnley was just edged out from winning the gold finishing in second place by less than two-tenths of a second. 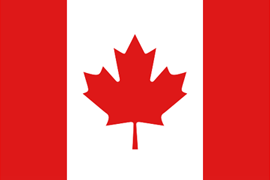 Wheelchair racer Canada’s Alexandre Dupont exploded from the back of the pack with 500m to go, taking the lead and winning Canada’s first gold medal in the Athletics program in 3:11.75. Australian Jake Lappin took bronze in 3:12.60 in the best international performance of his career. Speaking to media after the race, Fearnley took the opportunity to remind fans what the Commonwealth Games is all about. “I think that tomorrow maybe we can go back to work and speak to your co-workers about getting more people with disabilities in there or your education facilities or public transport,” he said. “We are doing it as a team, Australian team, Commonwealth Games, we are getting people with all experiences of life and celebrating it. 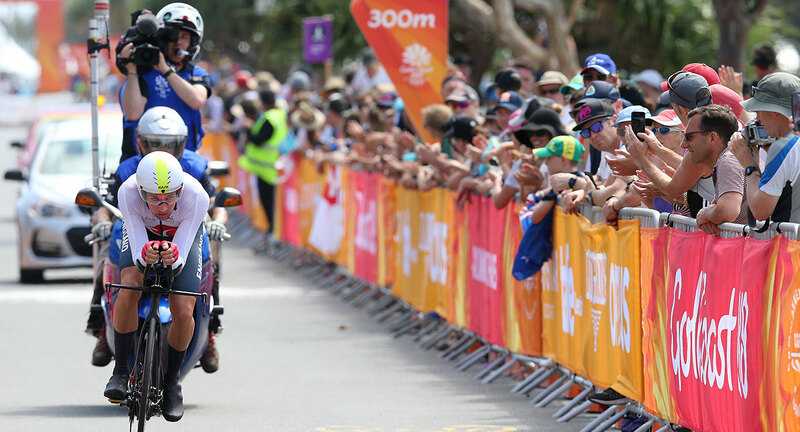 Fearnley will finish his sporting career competing in the men’s T54 Marathon on the last day of GC2018. What an amazing 24 hours for Trinidad and Tobago’s Michelle-Lee Ahye! Not only did the 26-year-old win the 100m Commonwealth Games gold and become the nation’s first gold medallist since 1998 on Day Five but she was also awarded a rousing version of ‘Happy Birthday’ in today’s press conference. 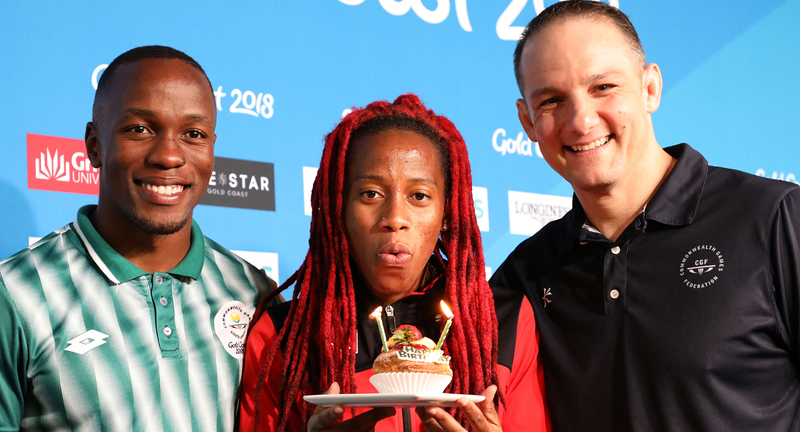 Men’s 100m gold medallist Akani Simbine of South Africa, Michelle-Lee Ahye and Commonwealth Games Federation CEO David Grevemberg pose for a photo after Ahye was presented with a cake for her birthday. 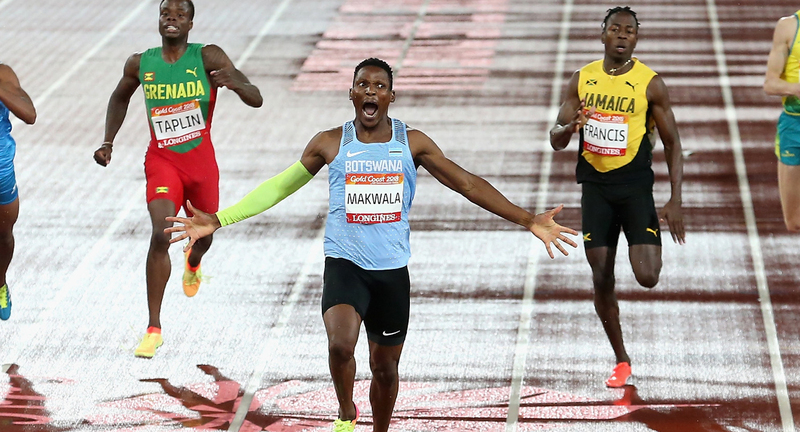 Botswana’s national champion sprinter Isaac Makwala fulfilled his promise of making a statement on the Gold Coast, inning his first major championship gold medal. 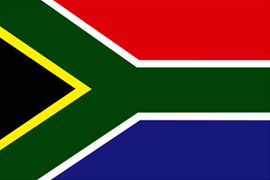 In what was a with a well-executed 44.35 in the men’s 400m final, Makwala secured the southern African nation its third gold medal at a Commonwealth Games. But the celebration didn’t end there with teammate Baboloki Thebe pipping Jamaica’s Javon Francis to silver and claiming Botswana it’s fourth medal in its history. Isaac Makwala of Botswana celebrates winning gold as he crosses the line in the men’s 400 metres final. Malaysia’s number nine seeds Rachel Arnold and Sivasangari Subramaniam have upset top seeds New Zealand’s Joelle King and Amanda Landers-Murphy with a win in the women’s doubles Squash competition. Too good for the current World Champions, Malaysia finished with a 2-0 in their opening Pool A match at Oxenford Studios. King was backing up after her 78-minute 3-2 singles gold medal win over England’s Sarah-Jane Perry the night before (Monday 9 April). The top two teams from each pool progress to the knockout stage. 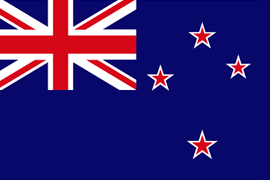 New Zealand’s next match is against Australia’s Number eight seeds Sarah Cardwell and Christine Nunn on Wednesday 11 April. 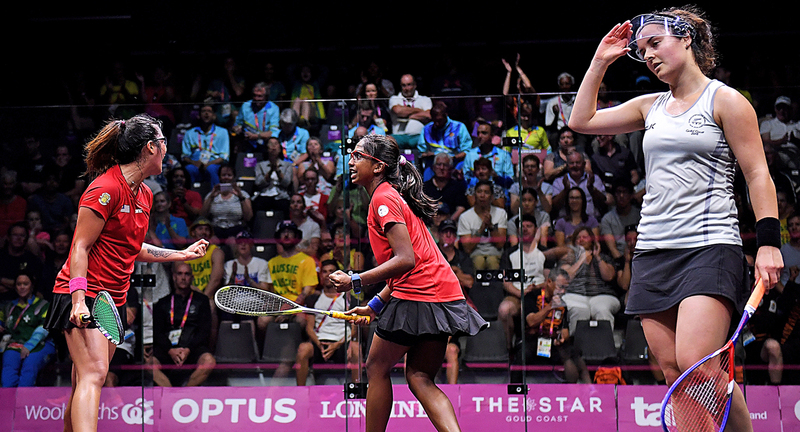 Rachel Arnold and Sivasangari Subramaniam of Malaysia celebrate after winning their women’s Doubles Group A match against New Zealand. 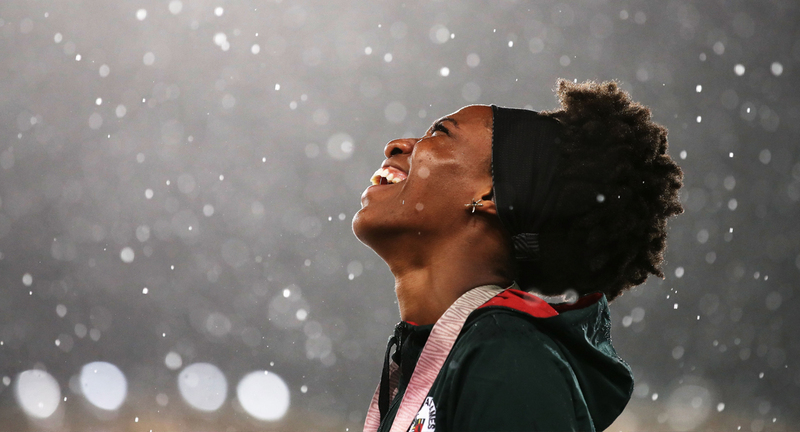 Bronze medallist Thea Lafond of Dominica looks on in the rain during the medal ceremony for the womens Triple Jump. 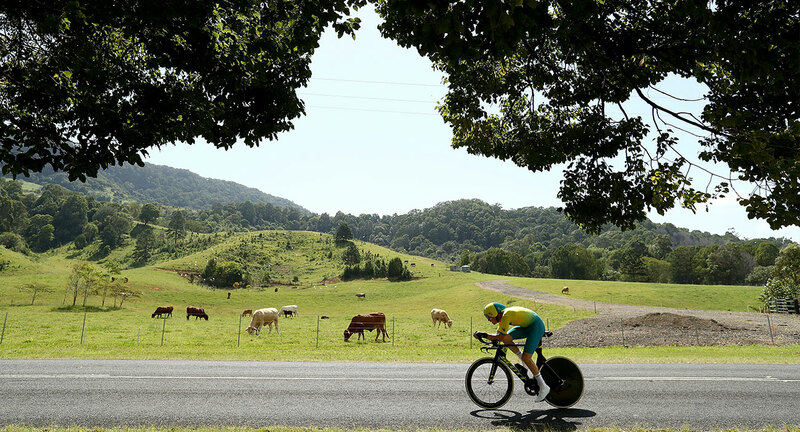 Australia’s Cameron Meyer cycling past a field full of cows during the Cycling Time Trial at Currumbin. 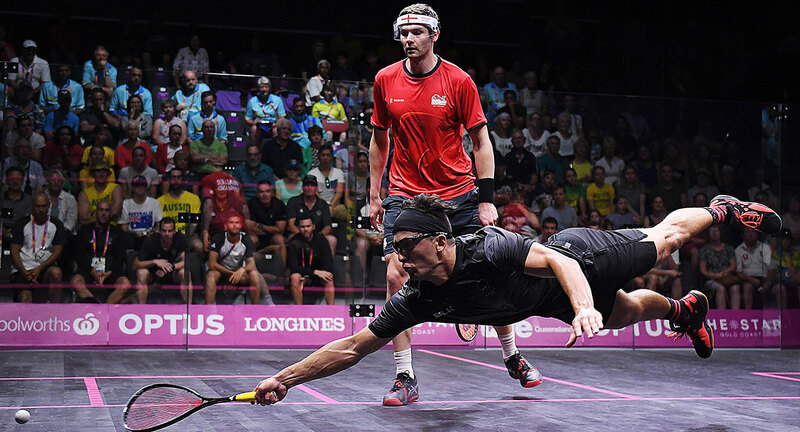 Zac Millar of New Zealand competes in the Squash mixed doubles match against England. The crowd reacts during the Beach Volleyball Womens Quarterfinal match between Miller Pata and Linline Matauatu of Vanuatu and Jessica Grimson and Victoria Palmer of England. Channel Seven cameramen follow Ian Bibby of England as he competes in the Cycling Time Trial. 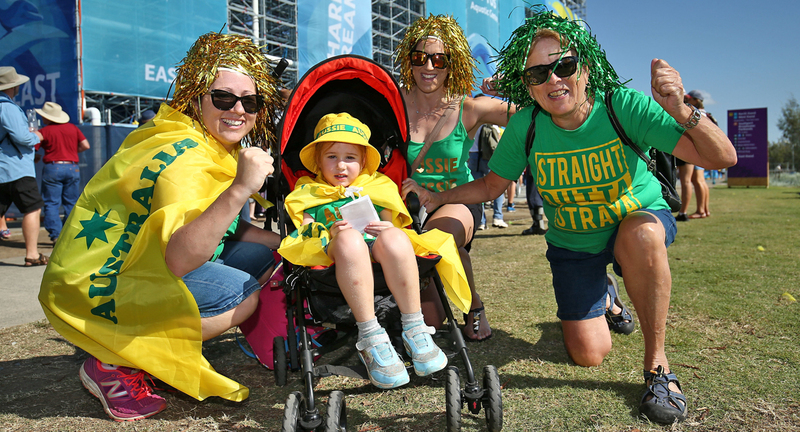 Spectators at the Optus Aquatic Centre decked out in their green and gold in support of the Australian swimmers. 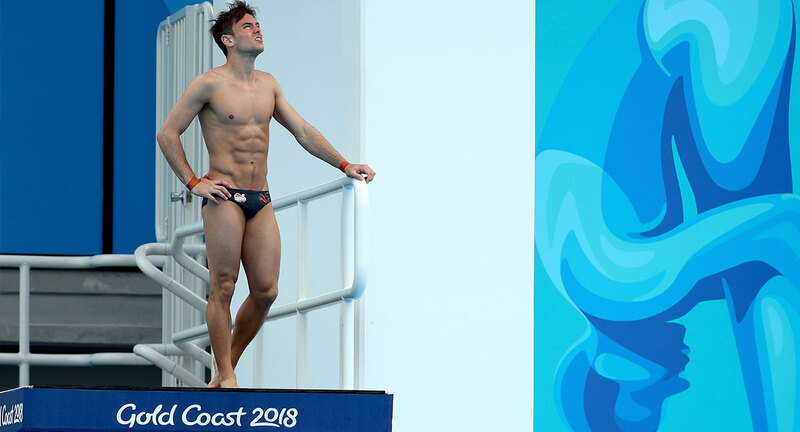 Star English diver Tom Daley has withdrawn from the blue riband men’s 10m platform on Saturday 14 April, citing a recurring injury. “Due to prior illness and with his hips being the determining factor, some of the dives Tom was due to demonstrate in the individual event would be too dangerous and impactful on his body,” said the British Swimming statement. Daley is still scheduled to compete in the men’s synchronised 10m platform event alongside Daniel Goodfellow on Friday 13 April. 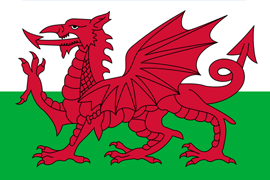 – How Welshman Nathan Stephens will be celebrating his 30th birthday tomorrow (11 April). – Australia’s Alex Hartmann following his second placing in heat five of the men’s 200m at Carrara Stadium. – England’s Kim Daybell on what he will improve on going into his next match in the men’s TT6-10 Table Tennis competition.